The Financial Times has become the latest news outlet to be hacked by supporters of the Syrian president Bashar al-Assad, following a phishing attack on the company’s email accounts. 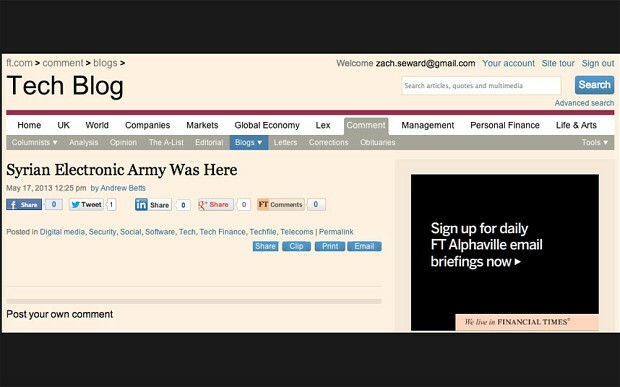 The posh broadsheet's Tech Blog - at "http://blogs.FT.com/beyond-brics" was compromised to run stories headlined "Syrian Electronic Army Was Here" and "Hacked by the Syrian Electronic Army". Twelve posts appeared on the FT’s tech blog between 12.38pm and 12.42pm on Friday, with official Twitter feeds also disrupted.